Los Angeles California, USA – Ronda “Rowdy” Rousey once again amazed the MMA world when she broke Cat Zingano’s arm in just 14 seconds during the main event of UFC 184 which was held on Saturday at the LA Lakers Home Court, Staples Center, Los Angeles California. UFC 184 Preliminary Card featured Philippine MMA pride, Mark “The Filipino Wrecking Machine” Munoz against Brazilian Roan Carneiro. 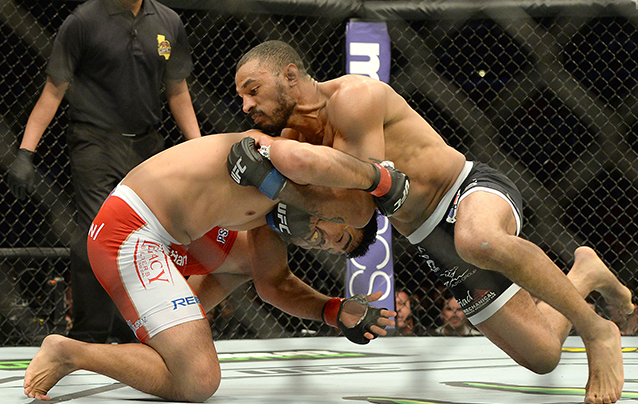 But unlike the undefeated Female American arm destroyer, Munoz’s hopes were crushed by Carneiro on his UFC come-back. It was June last year when UFC waived Mark Munoz and removed him from the middleweight rankings, but weeks after that, he was re-signed for four fight deal. During Anderson “Spider” Silva’s reign, Munoz was considered as one of the heavy-hitters in the middleweight division who can dethrone the former champion after he crippled “The Crippler” Bad Boy Chris Leiben. The Filipino was given a chance to prove his worth by facing the American Chris Weidman who eventually knocked out the Brazilian Jiu-jitsu Black Belter twice and seized the middleweight title. But Munoz lost the opportunity to face the ex-champion after getting TKO’d by current middleweight champ Weidman due to a bloody ground and pound with 3:29 remaining in the 2nd round. The Filipino Fighter regained his honor a year after he sustained a brutal TKO by out boxing Tim Boetsch and winning the bout by unanimous decision. UFC President Dana White gave Munoz another shot to move-up in the middleweight standings by matching him up with former light heavyweight champion Lyoto “Dragon” Machida which the latter dominated and sent the Filipino Wrecking Machine flat on the canvass with a left kick to the temple early in the 1st round. His last fight prior to UFC 184 was with middleweight ranked 7th Iranian Gerard Mousasi which resulted in another loss due to submission. Mark Munoz with 13-5-0 record prior to his comeback bout tried to regain his lost glory by facing an unheralded but more experienced Roan Carneiro with 20-9-0 fight history. But it was déjà vu all over again. The Filipino Wrecking Machine submitted to the younger Brazilian with a rear-hold-choke in just couple of minutes after the opening bell. And worst, Carneiro left Munoz unconscious on the canvass for few moments before getting attended by the ring physician. After this loss, we might see another high-profiled Filipino Mixed Martial Artist fight in a lower MMA league like Brandon “The Truth” Vera who was cut from UFC and recently debuted in One FC at the Mall Of Asia Arena against Ukrainian heavyweight Igor Subora which he dropped and finished off at the 3:54 mark of the opening round. Based on the contract which Munoz has signed, he has still 3 more fights left in the world’s most prestigious MMA league. But with this loss, he might get waived as early as expected or better case scenario, his sponsors might pull-out one by one due to his consecutive losses. Good thing that so far, no announcements have been made yet with regards to Munoz’s fate in the UFC. A single convincing win can prolong his stay in the league. Who knows, Dana White might consider to bring him to Manila in May for the first ever UFC Philippine Invasion? For sure, all Filipino MMA and Boxing fans will back him up and cheer for him. Money wise, it will be great to add Munoz on the Urijah Faber – Frankie Edgar fight card for a better ticket sales revenue.